to be honest, i made this recipe because i love showcasing the beauty of sliced baby artichokes even more than because of their flavour. same reason i was moved to make a clear soup with sliced baby artichokes last spring. gorgeous young artichokes are in every state. don’t they just look like art? if you’ve never prepared fresh baby artichokes before, do not be intimidated. the prep work goes quickly and having them hang out in a lemon bath so they don’t turn brown from oxidizing is not a big deal. and should yours discolour, don’t sweat it. they will taste just the same, and you’ll be eating the finished product too fast to notice anyway. set a large pot of water to heat on the stove for the pasta. squeeze the juice of the lemon into a medium bowl, fill with water and add the used lemon halves to the water as well. tear off the outer layers of an artichoke until the long, pale, inner layers are exposed. trim the stems to just below the base, and trim off any hard, dark green around the base. cut off the tips, about 1/2 inch from the top. 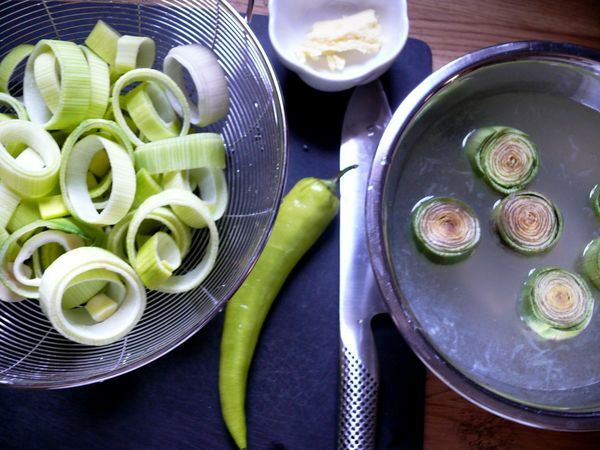 plunge the trimmed artichoke into the lemon water and let it soak. 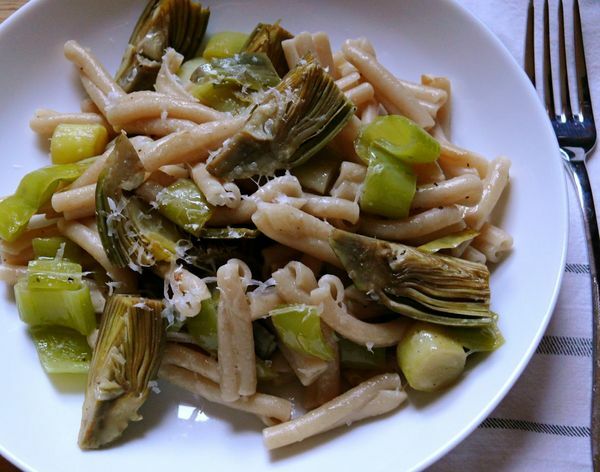 repeat with the remaining artichokes, covering each in the lemon water and leaving them there while you continue with the rest. discard outer leaves and trimmings. 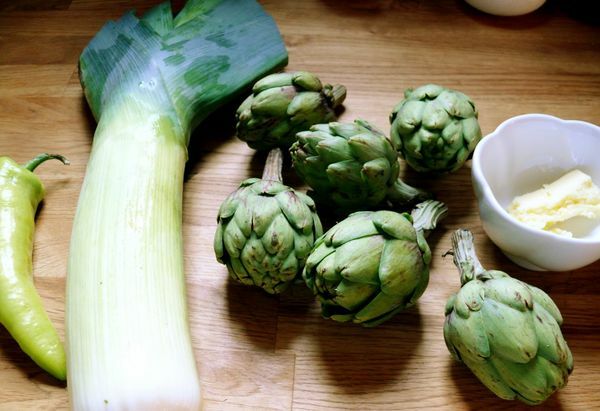 then, shaking off excess water from the artichokes and quarter them lengthwise on your cutting board. do not return the artichokes to the water. check to see that your pasta water is starting to simmer. if it is at a full boil, reduce the heat slightly to bring it down to a simmer before proceeding. heat the butter and oil in a large skillet over medium-high heat. 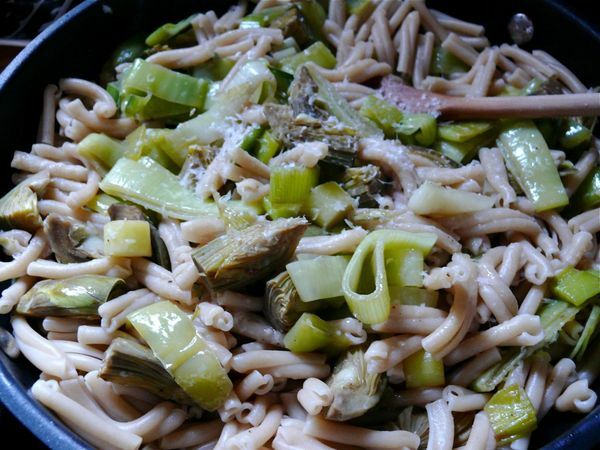 add the artichokes, leeks and banana pepper (if using), and sauté for one minute. add salt and pepper, and cook for another minute, stirring, until the leeks and pepper soften. do not allow them to brown. using a pyrex measuring cup, very carefully scoop out half a cup of hot water from your pot, and pour it into your skillet. let the vegetables cook in the water, stirring occasionally, for about five minutes until the vegetables are cooked through and the liquid has reduced. drain pasta and add it to the skillet. add half of the parmesan and stir through until the pasta and vegetables are well combined. remove from heat and transfer into serving bowls. top each bowl with remaining cheese and a drizzle of extra virgin olive oil and serve hot. This is awesome! I like the combination of the ingredients especially the leek and the artichoke.